'YES' - we have WI-FI in the condo, Big-Screen, HIgh-Def. SATELLITE TV, and we accept ALL Major Credit cards !! Download SKYPE and you have free-calling world-wide from our Condo too !! Stay CONNECTED in the perfect 'Business-Vacation-Condo ....... your office in Paradise' !! SIZE IS NOT EVERYTHING IN LIFE .... but there are 6 x 3 BR's at Terrasol, and our 2BR is bigger than them all - because of the expansive decks we have !! We are nearly twice the sq.-footage of many 2BR's that have 'very small' deck-space. At Terrasol, only the Penthouse - see 15309, it's ours too, is bigger !! Nestled at the very tip of the Baja Peninsula at Land's End, on the most magnificent beach on the entire Baja Peninsula, is TERRASOL, a spectacular low-rise, low-density private, quiet and secluded resort. An exclusive enclave, TERRASOL offers privacy and tranquility, yet is less than 500 meters from the bustling and quaint little town of Cabo San Lucas with its exciting night-life, cantinas, restaurants, and shops. Guests will enjoy amenities including the 2 swimming pools with swim-up palapa bar, tennis and a modest work-out room. Marina is 200 meters from our condo. Next to Terrasol, literally a minutes' walk either way, are the Playa Grande and Grand Solmar Resorts, where our guests can enjoy their facilities too, paying for use of kids clubs, day-care, Spa and Health Clubs, Restaurants and Bars, etc. 'That's not a greeting, it's a promise !! Your first morning at TERRASOL, is easy to predict. You'll wake up and witness sunrise. The cool Pacific breeze will flow up through TERRASOL as you turn on your coffee-maker in anticipation of breakfast. Step onto your deck... fill your lungs with intoxicatingly fresh Pacific air. With that first breath, it's as if all the world-weariness that brought you here is washed away by the waves that lulled you to sleep the night before. In its place, a smile [the kind that starts on the inside and works outwards] and an eagerness to try something new. Scuba-diving, whale-watching, golf, fishing, or strolling along your own, private 1-mile long beach and relaxing at one of the pools, reading your favorite vacation book - in quiet solitude and in the most perfect weather on the planet!! At TERRASOL, the laws of land no longer apply. Time not only slows down, it goes backwards, like the surf rolling off our beach as it meets up with the next advancing Pacific wave. - TERRASOL has a serene 'honeymoon atmosphere,' secluded and private. - Set apart from Cabo, TERRASOL offers exclusivity and privacy, but is still less than a short 2-minute walk to the Malacon, 5-minute walk to town. 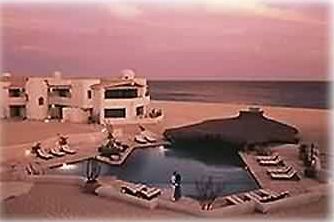 - Is built 'on' the beach, less than a KM from the tip of the Baja Peninsula. - Is deluxe, furnished with authentic Pueblo Mexican craft from wrought iron furniture and tables to wall hangings and hand-woven rugs, planters, crockery, and wall cabinet-credenzas. - The kitchen is very large, open and fully-equipped. - Cabo gets 6.7 inches of rain a year... officially a desert. - Highs of 80-deg. in the winter, 90-95 in the summer, non-tropical. - Temperatures tempered by the cool Pacific Breezes. - Sunshine: over 320 days a year, unbroken!! - Quite simply, the most agreeable year-around climate on earth. - The only desert-located Tropical resort area in the world - on the ocean. NOTE: 'Toggle' or 'Scroll' your mouse, to make IMAGES below larger !! Because I own another condo [very large 1BR] - see VRBO 4623 .............. already and have been very successful renting it out !! Privacy, quiet, indoor and outdoor living, spacious elegance, large and very airy, almost entire condo opening up onto wrap-around decks - letting in the Pacific breezes !! Stove, microwave, fridge, blender, coffee MC. What a lovely spot- exactly what we were looking for. A private, quiet beach with low volume of tourist traffic, a secluded enclave just a few minutes walk from downtown Cabo, and amazing accommodations!! We had Lori's two bedroom unit with a huge deck spanning the length of the condo at beach level, and a beautifully appointed two bedroom apartment. The kitchen and bathrooms are first rate, beautifully appointed with expertly done tiles and fixtures, everything totally first class. The restaurant has a swim up bar, excellent food, and is the cheapest of the beach front kitchens of the resorts on the strip. Of particular note is the amazing wildlife. We were there in early January and saw whales swimming literally within 100 feet of the shore, and there were even sightings of manta rays breaching the water. We did not go snorkelling, but there was plenty of sea life visible just walking the beach and the marina, all kinds of colorful fish, sea lions, and plenty of terns and pelicans. This establishment, and it's owner Lori, are highly recommended. Could not think of a better hostess, a lovelier location or a nicer place to stay. We’ve been to Cabo quite a few times and have learned to stay within walking distance to the Marina and town. All inclusives here are a waste for us because we love to try all the local cuisine and bars. This condo has definitely been our favorite! The condo itself had everything we needed and more. The wrap around deck was the highlight though! It was furnished above and beyond and spent much time there including sleeping under the stars one night! Unbelievable & sooo comfortable!!! This condo itself was not directly on the ocean but close and was in a very quiet and private area which we loved. You can walk everywhere!!! 2 beautiful pools, swim up bar and food & drinks great & priced very good. Mario at restaurant/pool bar was amazing and Carlos at desk extremely helpful. Full kitchen & outdoor grill gave us the opportunity to walk down to marina and buy fresh fish when the guys pulled in to take back to condo and grill ourselves! Yummm. Mario will also cook your fish for you if you’d rather take it to him. Browns Transportation was best choice we’ve ever made for trip to/from airport. Waiting on us with a sign with our name, took us to Walmart to stock up on way to condo and great guys! Craig Harrison made this all possible for us with all the info we needed to make it perfect! Even though we’ve been to Cabo this was the smoothest and best trip we’ve had! The beach and view we spectacular and our pictures look like they are right out of a magazine! Gorgeous!!! Thank you Craig! We will be back!!! We were lucky enough to get a condo for our 12 days trip only two weeks before we arrived. Our agent was prompt and helpful, putting us in unit #107 for one night and then unit #167 for the remaining 10 nights. The entire booking process took less than two hours including several email exchanges. This condo is on the north end of Terrasol up against the back side of the Playa Grande (both bedrooms’ large sliding glass doors face it). The front bedroom side and living area face toward the ocean but there is an obstructed view from the second sliding door in the front bedroom and only limited ocean view from the living area. The pictures of the “largest two bedroom…” lead you to believe you can walk out to the sand from the decks. This is not true as it is perched on a knoll with steep sand to a retaining wall. Unit #167 itself was adequate in space but needs remodeling. We had several maintenance issues needing attention. Knobs were falling off the shabby cupboards, the dryer was unusable even after cleaning piles of sand mounded on the lips of the washer and dryer. Most of the sliding glass doors worked poorly at best and the back bedroom sliding door was unusable. One of the screens on the sliding doors was totally off and sitting alongside, another was installed upside down and inside out. The bath towels were horrible, old and dingy gray (originally white?) and we had only one hand towel for the two bathrooms. The kitchen is well stocked with a new fridge and microwave. Beds were in need of replacement (lumpy). Our rental agent showed up at our doorstep with new towels for us and always responded promptly to our emails during our stay. We did not demand immediate repairs; we were happy just to be there at the last minute but take note that it may not meet your expectations. As for Terrasol itself, we love this place. The grounds are immaculate. The pools are beautiful. The complex is peaceful and calm. As usual, the Terrasol staff were terrific; without exception they are cheerful and welcoming, efficient and prompt. The Palapa Bar, open 8-6, is absolutely the best deal in town. Mario's drinks are good yet inexpensive and the restaurant’s breakfast and lunch are perfect and a real steal. Terrasol is a lovely location/community but if you have the luxury of several choices of units, be sure you do your due diligence for accommodation details and ocean view. Interesting how u can please most of the people, most of the time, but not all of them, all the time. I got this email Dec 22: "Hello! Hope you can help us. Our original booking fell through & we are looking to book quickly, as our arrival date is 2 weeks away ! Yikes!! I've stayed at Terrasol 3 times before - look fwd. to coming back". I had scheduled Maintenance to come in - but decided to help these folks out ! There are probably 40 x VRBO Terrasol units - I control about 1/3rd of them, most of the best, unique units - ALL others, a renter has to deal with Owners who live in the US-Canada. I live here - am "hands-on" - organized, prompt & solution-oriented. It's why I have 100's of renters who book in Jan-Feb-Mar for "next year" Jan-Feb-Mar ............ year-after-year !! I was contacted on Jan 7, by a "last-minute" renter, Shari - who told me that towels were too few & old - I asked Shari which towels needed replacing, beach, bathroom, kitchen - she told me which ones, and mentioned light bulbs too. That day, I had delivered ALL [with dozens of spares] new from Costco, probably 3 dozen fresh, new towels in all, and I met & introduced myself to the Tivy's. We got on well, joked & she seemed pleased. There was a "leaking" issue from upstairs condo, I dealt with that too & this issue disappeared. On the 8th & 9th, Shari asked me to have someone look at the Deck Sliding Doors, Clothes Dryer & told me about some drawer knobs - these were all taken care of me personally [with Terrasol Maintenance], "that day"
I followed up again on the 14th, asked them if everything was fine, they said it was - in fact, in writing, Shari said: "Tx for your help - we are having a lovely time"
My pictures show an overhead photo of the condo, you can walk out the front door, back door, the sliding doors in either of the 2 x bedrooms, or the lounge, and you walk onto "the largest Terrasol-Condo deck" [by a long shot] - and if you wish, onto "beach sand" - and if you choose, walk until you get onto the path that weaves it's way to the pool 75M away, & ocean, another 50M away. I have 13 x Terrasol condos - literally 1000's of happy return-vacationers & the Reviews that bear testament to this response !! Terrasol, nestled between two large resorts on the Pacific Ocean side, is a quiet respite away from the bustle of Cabo. It has been our winter destination for the past 7 years. The Terrasol staff are helpful from Mario in the Palapa bar to Carlos or Esther at the front desk. It is a quick walk to town to where all the restaurants and activities take place. Be sure to check out Misiones de Kino for dinner. Always one of our favorites. Or for cooking in, take advantage of the local produce and seafood markets as well as the tortilla factory. The condo is spacious with great outdoor seating where you can enjoy the beautiful sunrises or the stars at night. For spectacular views of the whales to sunsets, you have only to walk a few steps to the beach where you can sit in the many lounges and take it all in. The Harrisons met all our needs and made booking easy. We found several items missing in the condo and when the Harrisons were contacted, they were responsive and had the items delivered by the next day. We will be back! Beautiful space! Right on the sand, though not at the beachfront. 2 min walk down to the beach.